Think of...How much Jesus loved us to accept the cup of suffering He did not feel lilke drinking. The early Fathers and Doctors of the Church treated the great theological themes in the Passion and Death of Christ. The Paschal Mystery was at the heart of our economy of salvation and they considered the great themes of redemption, justification, salvation and atonement. This was all a vital part of incarnational theology and the Christological crises that swept the Church after the centuries of proscription. Analysis of the various steps in the Paschal journey waited until later centuries when, the doctrinal battles settled, the devotional practices could grow on solid foundations. 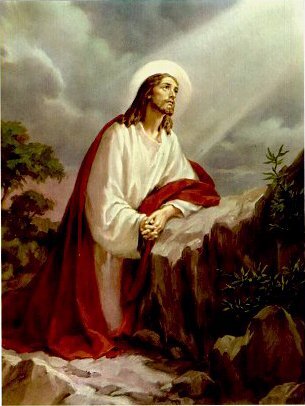 In the agony of Christ in the Garden of Gethsemane (the olive press), later writers would see tremendous significance in the prayer of Christ, His perfect abandonment to the Will of His Father, and the sweating of Blood, the first that we know He shed since the Circumcision. Books, articles, essays, poems and hymns have been written about each of these events, small against the great canvas of the Passion, Crucifixion and Resurrection, but large in the devotional life of the devout Christian. In the language of love, in the movement of the heart, each step on the way to Calvary is precious. It is that saving and loving journey which is described in the Imitation of Christ as "the royal road of the Cross." Christ has many who will share His joys and triumphs. Dedicated, indeed, are those who hasten to accompany Him along that road. Source: My Rosary, Its Power and Mystery; Msgr. Charles Dollen, 1988, p. 75. 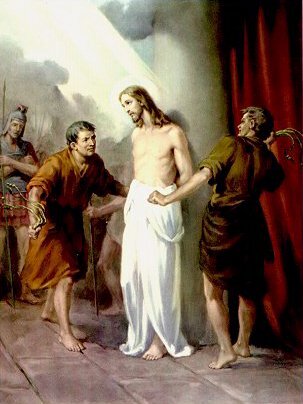 Think of...How much Jesus loved us to accept the pain of being scourged. The Gospels are so matter-of-fact about the scourging at the pillar that a casual reading might let us pass it by. In view of the death by crucifixion, it seems only a matter of prelude, one that deserves a passing glance and that's all. But the fact that our Lord always referred to the two together gives it a deeper significance. Many a slave died under the lash of the Roman executioners long before they set out for their crucifixion. One can only shudder to think of the kind of man who become a deliberate torturer. The brutality of action and the cast of mind that supported it are monstrous, to say the least. Yet Christ underwent this cruelty as part of His total act of love. He not only loved so much that He willingly put His life on the line in place of ours, but He allowed the death to be as cruel as possible. No one can ever doubt the totality of His act of love. In human love songs we sing of climbing the highest mountains and swimming the deepest oceans to prove our love, because we know talk is cheap. It is easy to say "I love you"; it's another thing to prove that love. The power of these sorrowful mysteries of the Rosary is that they make us ponder, in detail, how infinitely perfect was Christ's love for us. We come to the inescapable conclusion that this Divine Love has been poured out for us and in us. We also have to face the fact of both the reality of sin and its enormity. Source: My Rosary, Its Power and Mystery; Msgr. Charles Dollen, 1988, pp. 86-87. 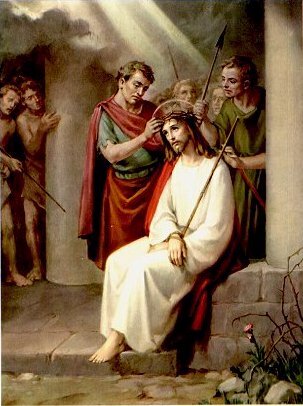 Think of...How much Jesus loved us to let men crown Him with thorns and laugh at Him. The crowning with thorns seems to be just an act of added cruelty that tells us much of the temper of those times and the rigor of the Roman rule. It was so unnecessary, and so unnecessarily cruel. But the symbolism cannot escape the Christian. Christ came in fulfillment of the prophecies to men like King David, that His rule would go on forever. Christ was of the royal race and lineage and He was to enter His triumph through the paschal mysteries. The apostles and disciples wanted an earthly King-Messiah, but that was a pale image of the reality, of a divine King who could grant eternal life and liberty and happiness, not the temporary good times of a wise and strong earthly king. Such a crown was of no more use to Christ than the crown of thorns. In this mystery, we see that the contempt that Christ suffered came from both Jews and Gentiles. None of our ancestors are innocent, if we want to pursue that thought. And if we want a modern application, we might examine ourselves for the prejudices we do have. In the contempt we show for others, we identify ourselves with those who mocked Christ. We can see Him in those who suffer from racism, sexism, opportunism, religious and economic intolerance, and oppression. And the power of another mystery of the rosary reaches out to us. Source: My Rosary, Its Power and Mystery; Msgr. Charles Dollen, 1988, pp. 98-99. Think of...How much Jesus loved us to carry His Cross to show us the way. For those who perform the Way of the Cross regularly, or at least on the Fridays of Lent, this mystery is filled with imagery. From the moment that Pilate hands Jesus over to the executioners we are accustomed to the high drama of the journey up to Calvary. 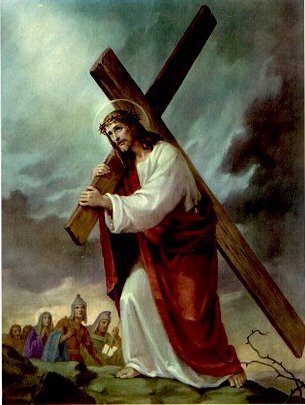 Jesus is made to carry the cross, and despite what some have written about Christ lovingly embracing the wood of the cross, that is hard to support from the scriptural evidence. He knew what the agony of that journey would be and how it would exhaust His human nature with its terrible pain. He seemed to have a special, human dread of the scourging at the pillar which preceded this awful passage. It is a simple matter of deduction to meditate on the falls along the path, and to place them at three is a pious thought. Meeting His Mother, comforting in a prophetic way the weeping women, and the legend of Veronica add a special dimension to the human response to His suffering. That one of the weeping women would probably have offered a cloth or a towel seems logical and suitable, but whether it happened, certainly, and whether her name was Veronica cannot be sustained with any historical accuracy. The character and role of Simon the Cyrenian has always captivated the imagination of those who comment on the passage to Golgatha. The fact that his name is preserved and his sons' as well, suggests that, if he wasn't a follower of Christ before, he certainly became one later. That he might have been a black man is also an ancient speculation. 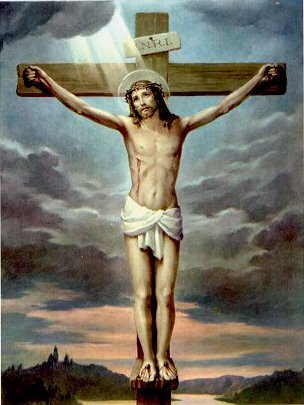 The stripping if Our Lord of His garments must have been particularly painful, since the bloody wounds must have adhered to the cloth. Whether Christ was naked on the cross is another facet that must be left to speculation. It seems that this was the Roman custom, despite the usual representation on crucifixes of a loincloth of some type. If so, this would certainly add another layer of shame and degradation which we usually pass over. It might have some special significance to our modern world. It has been said by too manay spiritual writers to pass by in silence, that meditation on the Passion and Death of Christ always helps us to manage our own crossses and duties more easily. Short of actually making a pilgrimage to the Holy Land, the Stations of the Cross and the five Sorrowful Mysteries of the Rosary are powerful devotions to the Passion and Death of Christ. They certainly make the Paschal Mystery, the central act of our salvation, come alive for each one, personally. And for those who have made the pilgrimage and walked along the Via Dolorosa, these devotions bring back vivid memories that help us relive those sacred events. Source: My Rosary, Its Power and Mystery; Msgr. Charles Dollen, 1988, pp. 110-111. Think of...How much Jesus loved us to die on the Cross for us. It's almost impossible to add anything to the gospel accounts of the crucifixion. Yes, we can check the encyclopedias, the histories and the biblical scholars to get even more details of what a Roman crucifixion was like, and it's pretty horrifying. The Italian and Spanish saints were very graphic in their sermons about the death of Christ and many of their artists depict the event in all its gruesome detail. The pounding of the nails, the wrenching of the body, the shock of the errection of the cross, and so on. The Fathers like to dwell on the theological depths of this event and to shoiw it for the great work of our redemption that it is. They see the glory of God and His mercy and love for a fallen race that could do nothing to save itself until the Son came, Incarnate. How Majestic was their understanding. Let the gospel accounts speak for themsleves. Let them touch your soul. Source: My Rosary, Its Power and Mystery; Msgr. Charles Dollen, 1988, pp. 125-126.